Although there’s always been an element of music in his set, 2018 is the year when spoken word performer, songwriter and multi-instrumentalist Attila the Stockbroker prioritise his musical side for the first time after 37 years and over 3000 gigs primarily working as a poet. Barnstormer aims to do with early music & punk what the Pogues did with Irish music & punk. Attila describes their sound as ‘Roundhead Renaissancecore and Baroque ‘n’ Roll’. Attila has always loved early music and plays a lot of the instruments – crumhorn, cornemuse, shawm, bombarde and five different recorders as well as violin, viola, mandola and mandocello. A lifelong socialist and activist, he has always been fascinated by the radical movements which exploded at the end of the English Civil War and the execution of Charles 1 - radicals who can be described as the first English socialists. And his songs are inspired both musically and lyrically by the events of that tumultuous time. So instruments and ideas fit together: they are from the same period. The songs are mostly based around the time at the end of the war, after the King was executed and, in the words of a ballad of the time, the world turned upside down. Previously marginal ideas of social justice and equality spread across the land. 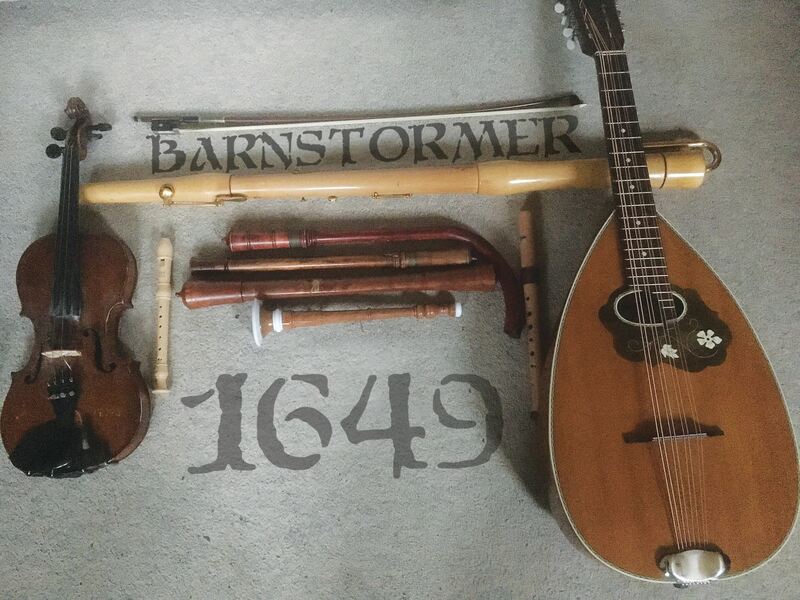 Barnstormer’s songs are about the Diggers, the Levellers, the Ranters and their leader Abiezer Coppe, the radical factions of the New Model Army and their confrontation with Cromwell’s grandees. There is an epic piece about the narrow escape of Charles 11 after the Battle of Worcester in 1651 in a coal boat which sailed from the spot where Attila has fished all his life in Shoreham Port, 400 yards from his front door. (If Charles had been caught, we’d probably be spending more money on the NHS now instead of the Royal Family!) There are some earlier references to Wat Tyler and the Peasants’ Revolt as well. And all with an eye on what‘s happening now, which is essential. Attila has written a couple of very modern early music songs too. One’s about a visionary with a beard and the initials JC! Although their politics are similar, there’s one very important difference between Barnstormer and the Roundheads though. Some Roundheads, apparently, thought drinking beer, dancing and having fun was evil. Attila and Barnstormer think it should be obligatory.